Thank you for your support! Feel free to leave feedback using the feature below. 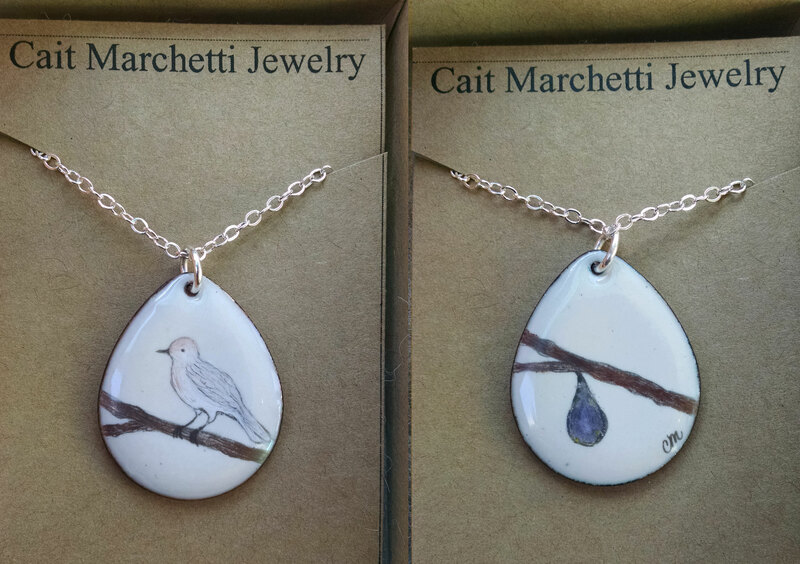 I ask that if there is any issue at all to first send me an email at CaitMarchettiJewelry@gmail.com in order to better help you. Don't just take my word. 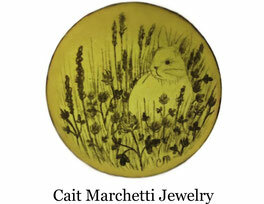 See what other customers have to say about Cait Marchetti Jewelry! "What a beautiful individual! Each piece she made had it's own personality and showed the love that she holds for her craft of story telling." Last Saturday, I did a market for my wife's business in Newport RI. I also did a little shopping because her birthday was immanent. There I met Cait: young lady selling beautiful enameled jewelry. When I stopped and admired one lovely piece featuring a sparrow, she said "turn it over - each of them has a front and back, and the back tells more of the story". We engaged in conversation, and I mentioned that I often by "bird decorated" presents for my wife, because her business is called Doves And Figs and you can't always find a dove. Cait said "I could do something custom for you". And I said "yes: but I need it by Tuesday, for her birthday" and she said "No problem, I can have it in the mail by Monday first thing". Sight unseen, I gave her copies of the Doves and Figs business logo, and we talked about options. Money was exchanged. Because both Cait and I forgot that the post office was closed Monday for President's Day, the present arrived Wednesday instead of Tuesday. (Cait offered to drive the 2.5 hours it would take to hand-deliver for the actual birthday, but I refused). And it's beautiful. My wife was very happy, and that makes all the difference. "I know Cait from back in high school and she's always been extremely talented artistically. 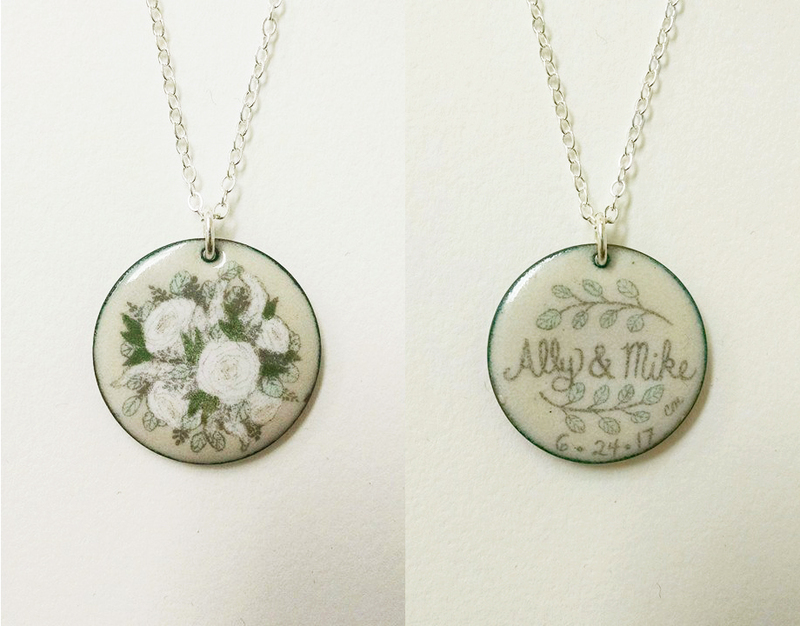 She came to me with the idea to make personalized necklaces for my wedding; as favors to my bridesmaids and I loved it! I sent her the names of the flowers we were using in the bouquets because I wanted a permanent way to remember the beauty of the flowers on the wedding day. 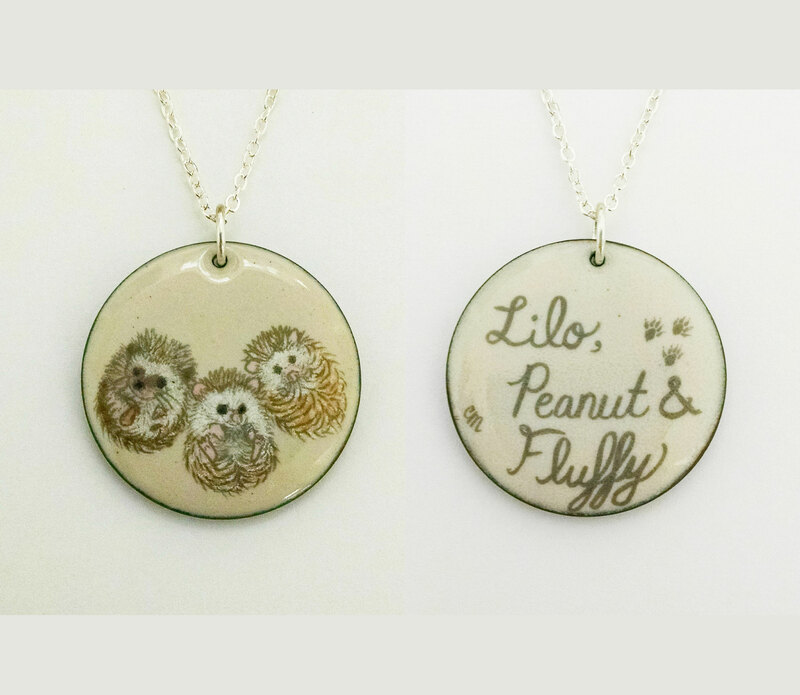 She spent time designing various layouts and designs for me to choose and we came up with the perfect necklace. She also added in the date of the wedding on one side making it even more special. 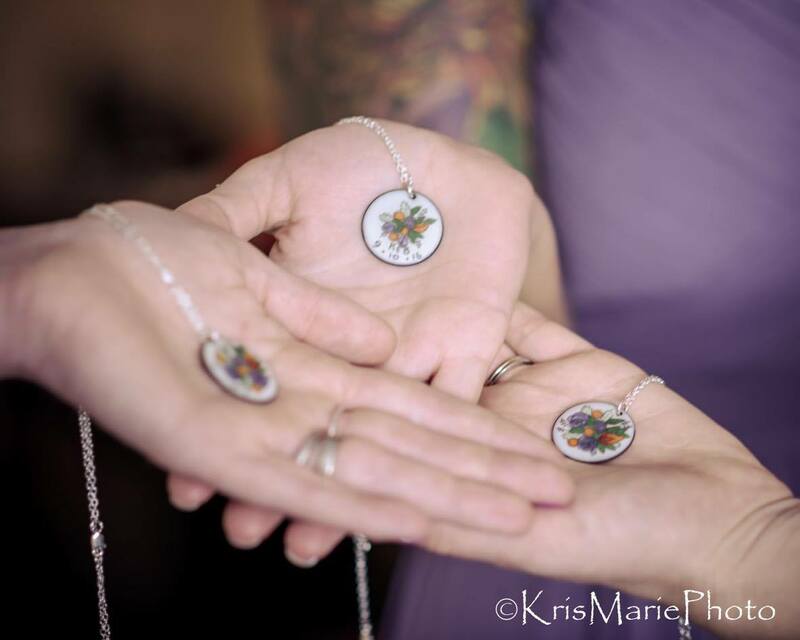 I liked the designs so much I also added some with smaller pendants for my flower girls. She delivered them to me in cute boxes with tags ready to go! She had the order done exactly when she said she would and I was very happy with the purchase! 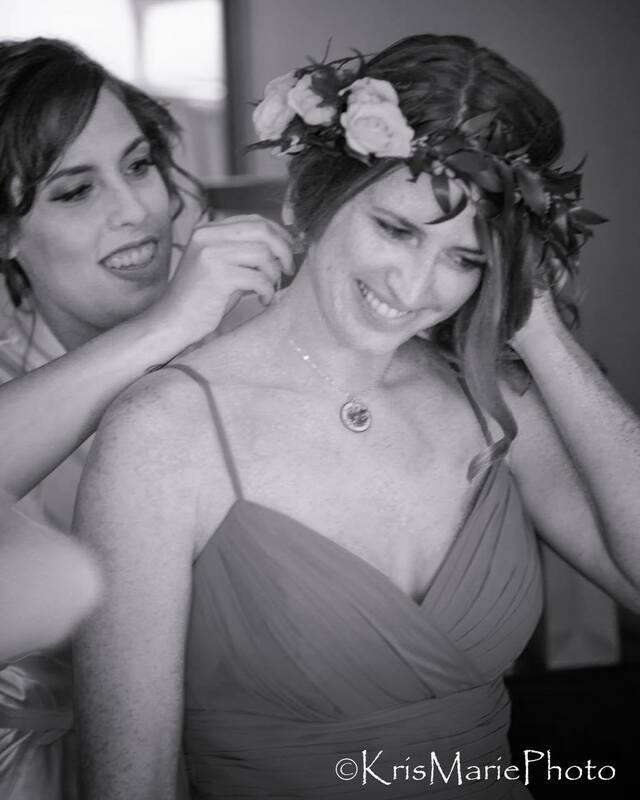 The girls all wore the necklaces on the wedding day and they looked perfect with the dresses. Most of all each girl has a reminder of the beautiful flowers (that as we all know don't last long) on a necklace they will have forever!!" I bought a beautiful flower necklace from Cait at the New Bedford Art Show. I wear it a lot and always get compliments on it. She is one of my new favorite artists. I have purchased Cait's jewelry at a show and then on line. Cait is a very likable artist who proudly and eagerly showed us the processes for creating her jewelry. The jewelry is not only beautiful, but is good quality as well. My order through the web site was a custom order, and Cait worked with me to get the gifts exactly the way I wanted them. I am very pleased with the jewelry and service, and would (probably will) order more jewelry from her in the future. I just received my order, a lovely bracelet for my granddaughter's 15th birthday. I'm very happy with it and I know she will be, too. I first saw Cait's work at the New Bedford Folk Festival and I really loved what I saw. This is my first purchase from her, but certainly not my last!